I owe EVGrieve an apology -- Grieve posted the Bowery exhibit with its poster and without irony. Still, I don't see in our neighborhood the kind of policy broadsides that thrive in other neighborhoods: QueensCrap, DevelopDon'tDestroy, AtlanticYardsReport. We have only Suzannah B. Troy -- often a lone Cassandra turned from every door. When the local blogs began to appear, I expected, unrealistically, they would represent a face of resistance or at least alterity, an East Village Otherblog, as if they would all be written by Penley and Flash. It's not the bloggers' fault -- not everyone has the resistance pathology, identifies with it or has a taste for it. Maybe this blog is supposed to be the resistance blog. I wish I had a taste for blogging. 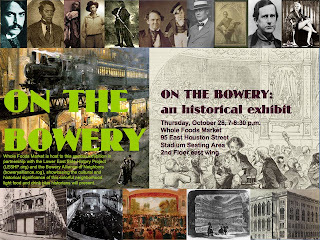 None of the local bloggers have bothered to draw attention to the Bowery Alliance of Neighbors' effort to preserve the Bowery with its historical exhibit On the Bowery. Instead, they focus on the easy, appealing, fun irony of the exhibit's venue. Irony and complaining or action, which is the value? The former are the easy choice. Isn't irony the yuppie generation's favorite mode and complaining their favorite voice? I grew up in the crude 60's, when activism had no irony. I've been working with BAN since its inception, surveying the Bowery, researching, schmoozing political office-holders, writing documentation, and now, creating an exhibit. A show at Whole Foods, with it high volume of local patrons, makes it an ideal venue for exposure. And it's in a public space that is frequented by Bowery locals -- not just shoppers (though the complainers won't know that because they are too caught in their own political correctness to recognize the urban nature of public space that real, ordinary, truly local people use). The irony of the venue seems so much less significant to me than the fact that so many people will see this exhibit and will learn not just the forgotten history of the Bowery, but also the preservation struggle, which is the thrust of the exhibit. So while I am conscious of irony in the choice of venue, I am amused and disappointed in the unanimous blog response to the exhibit, focusing on that irony while completely ignoring that the exhibit is an important step in raising awareness of the Bowery to protect it. I appreciate that local news media concern themselves with maintaining their profile before their audience, and the hook of an irony has a much higher profile than the dull fare of asking the audience to get active -- it's so much easier to complain about gentrification than actually do something about it. 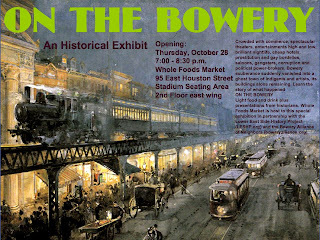 If any one of the EV bloggers had bothered to investigate the Bowery exhibit at Whole Foods, that blogger would have found that the direction and point of the exhibit is preservation. Sure, there's a grand historical narrative, and lots of intriguing characters and surprising stories, but the preservation point is doubly reinforced, clearly explained in text and graphic image. To me, the bloggery 'irony' response to the Bowery exhibit seems cheap -- superficial and irrelevant, self-serving and masturbatory. If the designer of the exhibit has to be the only blogger out there to tell people that BAN IS STRUGGLING TO PRESERVE THE BOWERY with, among other events, an exhibit at Whole Foods for the preservation of the Bowery as part of BAN's work to preserve the oldest and most richly historic street in New York -- then I'll be that only blogger. The lament has a distinguished literary precedent. I admire it and appreciate it as a record. But I'm an activist. Maybe that makes me blunt, even crude. My repertory of tactics is limited to vocal criticism. It always gets me in trouble. So here it is: our LES bloggers are full of complaints that aren't helpful. I wrote and designed the exhibit. (Grateful thanks to Mike Geyer, Honey Millman and Andrea Coyle, without whose generosity and resources it would never have happened). Go take a look. Flyer and card below. Whole Foods, whatever you think of it, provides a public space on the second floor at a time when there are fewer and fewer public spaces in NYC. A lot of Bowery locals -- people who live on the Bowery, work there, people from the Mission -- hang out at the public space at Whole Foods every day. So I kind of like having this exhibit in this public space where local people can happen on it and enjoy it and learn about the history of the Bowery. Reminds me of the spread of MacDonalds and Burger King. We all complained about fast-food chains coming to New York (this was in the 1970's). But if you actually spent time in the Burger Kings (not MacDonalds which was family oriented, even in its decor), you'd see circles of working-class recent immigrants hanging out there together, with a cup of coffee three hours old. Nobody bothered them. And soon enough, Burger Kings became a local working-class site. The Whole Foods gallery space has this feeling of being a little like a park bench. It doesn't belong to anyone, no one bothers you. And, unlike a park bench, even the police aren't around. Thursday, October 28, 7:00 PM - 8:30 PM. Come and mingle with LESHP and community friends. "Michael Shenker was the greatest man I ever met," said Seth Tobocman at last night's memorial. I can only copy his words: Michael Shenker was the greatest man I ever met. He was also a big piece of this neighborhood and its character. People are considering a permanent memorial for Michael -- naming a garden after him, for example. This doesn't even remotely approach the significance of Michael Shenker. Someone coined the verb "to shenker" -- maybe for 'illicitly jimmying electricity', or 'opposing all authority flagrantly and fearlessly'. That's getting closer. Fly announced the first Saturday of October as Illumination Saturday for his electricity, literal and figurative. That's a start. There has to be more, much, much more. Michael was not famous, not a self-promoter, not a national name nor a headliner. He was bigger than fame. Michael's life has something deep to give, and it would be a shame if that were lost to the history of a few brief moments in a corner of the city. His life had something important to say not just to us here in the LES, but for everyone in this city today and (I believe this) for humanity. The funeral banner motto sets it just right,"Would you rather be safe and live in the darkness, or take a chance and live in the light?" As Seth Tobocman said several times last night, Michael was free and fearless. That's what should be memorialized, not just among ourselves, but everywhere, as a demonstration of the possibilities of life. Everyone should know what the LES was all about, what the LES can grow and create, what kind of courage we aspire to, what kind of independence and commitment and passion. Everyone should know who he was, how he lived and where. At the memorial last night Seth Tobocman added that he didn't get to walk with Martin Luther King, but he did get to walk with Michael Shenker. I have the same feeling about Michael, but not because of what Michael did or accomplished, or his aspirations or his beliefs, but because he knew how to live, freely and intrepidly, and because he so comprehensively understood his intentions and motives, and expressed those intentions so brilliantly. I admired Michael not as those who participated in his struggles, by the way. I didn't share with him one of his basic positions and I didn't participate in two of his most important occupations, the squatter's movement and the 'community' gardens. I wasn't a squatter, so I didn't get involved with the movement, and I didn't (and don't) join the garden movement, partly because gardens are not truly public, and partly because the gardens were by the time of the movement, already a sign of gentrification. I've seen many gardens lead to disputes and divisions in a small community -- disputes over space, because the space is quasi-private, not truly public. I believe open space should be wholly public, and while I don't subscribe to any ideology, to me the public parks are one of the few instances of unalloyed success of the socialist ideal: the government keeps it open to all and no one can dispute its space. Don't get me wrong -- I admire the garden movement as a community movement, and I appreciate its work to keep green space. But by the time the garden movement had begun, most of the gardens in the neighborhood had been transformed from their original Loisaida craziness into a kind of self-gentrification of its own: conventional landscaping made to look pretty in conventional ways; carefully circumscribed plots of tomatoes and vegetable patches, assigned to this or that member. None of this was the character of the gardens when I moved here when locals were beginning to claim the empty lots left by fire and demolition. Those early 80's gardens were each unique, crazy, original as only the LES could be. Pretty they weren't. The gardens reflected the apartments of the weird tenants: packed with the stuff of some odd mind's obsession, freely spread around. The walls of one apartment flowed with fine copper wires hanging in broad reams like a bright orange waterfall; another piled with furniture to its ceiling, unused and unusable, crowding every inch of space save a narrow passageway to the bed. The people here, their apartments and their 'gardens' had character. It was not about reproducing the comfortable or attractive spaces of the middle class, or the amenities of the suburbs. It was uniquely New York and uniquely LES. So I didn't share a lot of the struggles that Michael passionately led, or his aspirations. In the 90's I stayed away from community activity entirely, disillusioned after participating in demonstration after demonstration through the late 80's only to watch the fight against gentrification develop into nothing more than a pointless and self-defeating rage against policemen-on-the-job -- police, the lowest arm of government lacking any policy-making, and policemen, working men with little or no understanding of the issues, faced with an ugly task, to stand against the citizen. I gave up any hope for this community's ability to organize beyond its own personal anger. I spent the 90's instead fighting for public higher education against Giuliani's intent to downsize CUNY and limit access to it. I believe in public institutions that benefit all the public. Bob Arihood rebukes me that college is pointless. If he's right, then my efforts were foolish. So who am I to cavil over others' struggles? At the memorial last night there was a moment of difference between the audience and a speaker. I thought at first it was a blemish, but then rethought. A memorial that is nothing but blandishments and encomiums is not the truth. Michael got involved and that's staking a position. We should remember honestly the real man -- that was the extraordinary man. No one wants to remember the undertaker's make-up. Besides, you didn't have to share Michael's beliefs to appreciate that this man had grasped the meaning of life, that by guarding his freedom, he'd let loose his passion -- in all directions. Everyone who was in contact with him felt it, judging by the accounts at the memorial last night. He made a difference; he helped a lot of people; he led a lot of struggles; he accomplished something. And he did it out of his freedom and his passion and his brilliance. That's the greatest person I've known in my time. Everyone should know about Michael Shenker. Everyone should have known him. I envy to no end all the squatters and garden folks who got to work with Michael regularly. Once he became a squatter, I didn't get to see him much anymore -- and every single time I walked through the park I hoped to encounter him. I loved to listen to his talk when I did. He should have lived longer. Long live Michael. Here is a list of memorials, thanks to EV Grieve. There are many testimonials in the comments section in Colin Moynihan's fine NY Times City Room piece. 7 p.m.; music starts around 8 p.m.
Burt Ekoff, Michael's piano teacher, and friends will be performing. Michael was a co-founder of the More Gardens Coalition and a force behind saving NYC gardens. Reverend Billy and the choir will be at this event. Meet in the middle of Tompkins Square Park at 5 p.m.
Friends will march around the neighborhood and arrive at his funeral. 7 p.m. at 55 E. Third St.
Celebration of Michael with Eric Drooker and Eden and John's East River Strong Band. I first met Michael in the early 80’s at Hunter College in the music department. He stood out not only because he seemed to be the sharpest and most knowledgeable musician among the students, but because he seemed at once to own the department and the department couldn’t quite contain him. His natural brilliance didn’t belong in the confines of the classroom or within the distinctions of faculty and student. His character fluently spanned such lines of propriety. It was an unusual environment to see him in — college is intellectually friendly but also orderly and proper, so he was welcomed, but wouldn’t stay long: he was too independent. Later I saw him in the neighborhood where he would overwhelm me with that outpouring of political eloquence — an irresistible river let loose. I know very few who could speak so well as Michael. That’s what I really loved about him — he could speak expansively with knowledge and resonance. I always hoped to encounter him in the street or in the park just to hear him talk again. The neighborhood back then drew many extraordinary independent spirits who thrived in this place that was so completely abandoned by money and mainstream interests. Michael was one among the brightest lights here. [...] Michael was an intelligent caring person who put himself on the line repeatedly — he was a real doer. Thanks to Michael’s efforts, more than a dozen abandoned buildings were opened, made habitable and ultimately “legalized” under an agreement with the city that put an end to countless HPD raids and court battles. [...] The squatters did not steal housing from anyone. Rather, it was phony poverty pimp organizations holding buildings vacant until public financing was forthcoming and the city itself, which allowed buildings to remain vacant and crumbling rather than continue the successful homesteading (sweat-equity) program that ended just before the squatters took direct action in the 1980s. The squatters did not pave the way for the subsequent gentrification on the Lower East Side that was coming anyway — for close to a decade, the squatters stood in the way of yuppie ghetto developments, ultimately winning their fight for their right to remain in their homes. Michael was in the middle of all of this, from the earliest days of squatting in the early 80s through the present. His contribution and his wonderful presence in our lives can never be fully expressed, but those of us who knew him knew and appreciated that he was special.